“I owe Dr. Regan a lot...He gave me my life back. 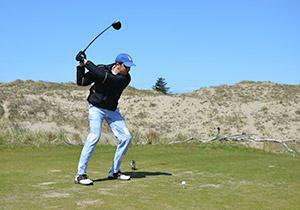 And today, I’m not limited at all — in fact my golf game has never been better,” Patrick reflects. Patrick has a family history of scoliosis, so his parents were careful to keep a watchful eye on his spine during his growing years. He was diagnosed with scoliosis as a teenager. 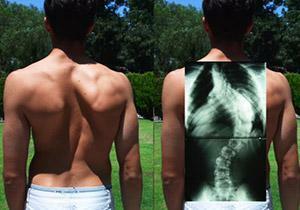 When he was a sophomore in high school, X-rays of his spine revealed his curve to be 50 degrees. 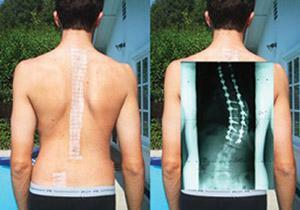 His doctor suggested a back brace to help prevent further progression of the curve while growth in his spine remained. The goal of bracing is to prevent further progression since the brace cannot correct curves. Patrick wore the solid plastic brace for three years and it did help slow the progression. Several years passed, and during his sophomore year at Harvard while playing baseball, Patrick noticed some undesirable symptoms. He felt winded while running to first base, which is not normal for a college athlete; he also noticed back pain while sitting still. Because Patrick was an athlete, his core strength was one of the reasons why his spinal curve did not prevent him from staying physically active. In the spring of 2003, Patrick made an appointment for a check up on his scoliosis progression, in response to persistent shortness of breath and back pain. Patrick had also believed that his spinal curve had become more noticeable. Even still, Patrick continued with an active lifestyle — he would lift weights, play baseball and golf regularly. At his doctor’s appointment, he was alarmed to learn his scoliosis curve had progressed to 77°. Patrick’s curve had worsened to the point that his right lung function could be compromised. He was referred to a scoliosis surgeon who told him surgery was necessary and would involve an open anterior approach. During an anterior surgical approach, the incision is made through the side of the chest which is more difficult than a posterior approach. Patrick sought a second opinion - he knew the importance of taking an active role in his healthcare and seeking out the most experienced scoliosis specialist. He was ultimately referred to Dr. John Regan in Beverly Hills. Dr. Regan is a fellowship-trained orthopedic spine surgeon with expertise in minimally invasive surgery techniques. During the appointment, Dr. Regan examined Patrick and reviewed his medical history and recent diagnostics. He next reaffirmed to Patrick that due to the severity of his spinal curve, surgery would be necessary. Dr. Regan also cautioned Patrick that the surgery should take place soon to avoid further threat to major organs. Patrick’s symptoms were worsening, he was having difficulty taking deep breaths and his pain symptoms were more intense. Dr. Regan talked with Patrick about a less invasive surgery option to correct his spinal curve that would involve placing screws and rods through needle punctures of the skin instead of a traditional “open” approach. This type of surgery is known as CD Horizon Longitude by Medtronic. Dr. Regan reassured Patrick that scoliosis surgery would not mean the end to his active lifestyle — he would still be able to play baseball, golf and participate in other physical activities. Patrick was relieved to learn that a less invasive option was available to treat his scoliosis and chose Dr. Regan to perform the surgery. Dr. Regan performed the multi-level scoliosis surgery using the less invasive approach and the surgery was a success. Though his recovery was not easy, the fact that Patrick was physically strong before surgery helped speed his recovery after surgery. Patrick noticed nearly an inch of growth in height following surgery. He returned to activity gradually. Six months after surgery he returned to lifting light weights, and by nine months he was able to lift heavy weights again. A few months later, Patrick was able to lift more weights (bench press and all other exercises in his regimen) than he could before surgery. His golf game has also improved: before surgery his handicap was 8, and now (ten years later) Patrick’s handicap is 2.7. He incorporates core strength training into his workout routine to help keep his back and spine strong and more resistant to injury. After completing his bachelor’s degree at Harvard, Patrick completed an MBA at Stanford and now enjoys a successful career. “I’m so thankful I found Dr. Regan and was able to avoid the more invasive scoliosis surgery presented to me by another surgeon,” Patrick reflects. The pictures displayed in Spine Group Beverly Hills are images of physicians, patients, and employees who have consented to have their pictures on this website. If you are viewing in Internet Explorer 8 or older you may need to update your browser.